#12, Geranium (10×8) an oil pastel painted on gessoed prepared hardboard using Senneliers, Holbeins and Mungyo brands of oil pastels. This time gouache was used for an overall underpainting to give the background a light purplish, pink, salmon hue – hoping that these colors would set the stage before I began to buildup layers of oil pastels. I’m thinking the background worked. I was going to take a razor and begin scraping after the OPs were applied, and then re-apply perhaps giving more of an impressionist feel to the piece. But thought otherwise once the final scene started to unfold – sometimes you have to listen to your gut. Thanks for checking in on the progress of this challenge, I’ve really enjoyed it and the benefits from it are countless. Click onto the image for a larger view. 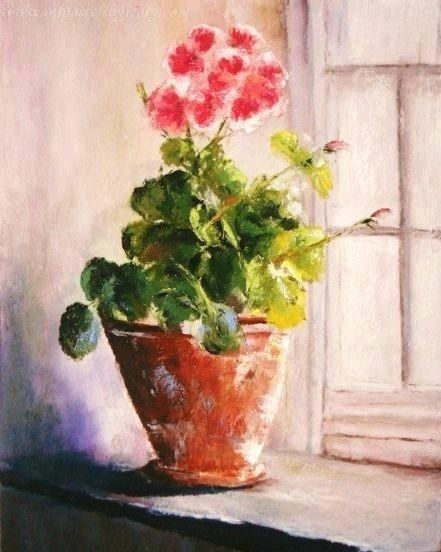 This entry was posted in Challenges: Subject Matter Studies, Flowers, OPs New Paintings and tagged fine art, flower, geranium, impressionist, oil pastels, painting. Bookmark the permalink. This piece reminds me of my mother, who is forever planting geraniums in terracotta pots, and puts plants and flowers in every corner of her house/yard where there’s a shred of sunlight. I also like that this piece is bright and hopeful. Thank you so much for your generous feedback and awesome that the painting reminds you of your Mother and her plantings, such a compliment! Thank you so much for your lovely comment, I really appreciate it. Thank you also for the generous award unfortunately I don’t accept awards any longer, but for me it’s a real honor to receive a nomination by a fellow blogger on WP – makes it special and is very much appreciated! Another piece celebrating light! Lovely! Hi Elena, thanks very much – truly enjoyed working the light in the piece. Oh this is perfect! Absolutely love all the shading and highlights. Well done! Thanks so much Jess – really appreciate your generous feedback!! This painting has the allure I feel when I only have that one round orb of blossoms and can’t wait for the next bunch to begin popping open, which will happen with the beautiful light streaming in that window. I like the feeling this one gives off from the get-go. Kind of like a promise of things to come. Good one, Mary! Hi Leslie, thanks very much just love your description as seen through an artists eye. This was one of my favorite flowers to paint in this series. Have a great week Leslie! I love geraniums Mary ! With the sunlight streaming into the scene I feel the warmth and simplicity of life here in your little vignette … the old weathered pot holding this beauty is perfect .. and its shadow enriches the whole colour palette …Gorgeous . You ‘re doing grand with this series , really you are Mary ! Thank you so much Poppy – I’m loving your response! There is something nostalgic about flower pots in sun-filled windows – perhaps there will be more coming over the next couple of months. Never know. I really appreciate your continued support and encouragement – I’m thinking of getting back to painting quiet landscape and turbulent seas once again, it’s been a while. Have a great weekend. Beautiful Mary. I like the different colours in the wall, especially the darker corner where there’s shadow. I LOVE geraniums. When I see them I’m reminded when I once had time to garden and I had planted geraniums. As well the time my father and I bought a whole bunch of seedlings. The colours of the leaves, darker and lighter where the light hits. The petals….gorgeous. I think this is my favorite. Thank you Joanna – I really enjoyed reading your thoughts and description. Thanks for noticing the wall colors, there are a few in there that didn’t show very well on the photograph – so I appreciate your mentioning them. The leaves were a bit worrisome, but was able to pull them through with the lights and darks. Geraniums are steady and beautiful, a summertime staple – I’m with you and just love them. Have a lovely evening. This is a lovely composition Mary. I love the window in the background. Thank you so much Beth – really appreciate your thoughts on this piece. Thanks Susan – then it’s time to bring on the summer heat! I love flowers in general. Tulips are my favorite for a bouquet. But as a French native geraniums win my heart. In a window box they remind me of my homeland. I grow them year round and I love them red in clay pots. Yours is exactly why I love geraniums so much! Thanks so much Evelyne for your beautiful comments! I’m thrilled that this piece took you home and down memory lane, that is a wonderful compliment. Your progress is astonishing, each and every time you add something different, something new! In this case you have chosen a flower pot which is an absolute perfect fit for the geranium. Using window cells for flowers as a set up really brings out and compliments perfectly the flowers. The use of light is superbly executed, gives warmth, a graceful and delicate touch. The flowers really come alive under your brush Mary and this series is by far your best challenge you took upon yourself! I believe that 15 piece collage is going to be amazing beautiful! Looking forward as well to see it not only for the beauty of it but for the visible progression of your technique from piece to piece! amazing paiting, Mary!!! it is very beautiful!! Thank you Cha – love your feedback! Best shade behind a flowerpot ever. Prospero you have made my day, month and year – I consider this a greatest of compliments! Thank you so very much – wish you could see the piece in person, the colors and depth show much better. Thanks again and have a wonderful evening. Thank you my friend – the flower is sunny warm and healthy, plus very happy! Thanks Marina and I hope that this week is a beautiful one for you. Thank you very much Janell! Glad you liked the Geranium, they are a fun flower to paint with their soft/furry leaves and delicate flowers – they are more of a rich flower than what I thought. Have a lovely week. Mary, this is a lovely series. Once again, I love the window setting. Thank you Gallivanta – I’m so happy that you are enjoying the challenge. I’m finding that painting windows I’m forced to work lighting in ways I haven’t before, which is becoming a good thing as I move forward. Hope you have a beautiful week ahead. I am so impressed with what you do Mary! This is great. I love it! Thank you Dorann – what a beautiful thing to write. Glad you enjoyed the painting. Wow – so very lovely! Thank you Fiona, much appreciated! Mary – you are clearly on your game. The advancement in your work is surreal. Wonderful to receive your feedback and compliment Craig – made my day! Thank you so much – I hope that the advancement translates once I start back with landscapes and seascapes, of which I’m looking forward to. Thank you Uncle John for your beautiful compliment. Thank you Geralyn – great description! Loved it ~ best wishes on your marathon! I see a real command of the medium here, where skill can allow a certain freedom….freedom to go with instinct, because the hand and eye know what they’re doing. The pot is superbly rough feeling and the white patches throughout are stunning. Congratulations, Mary! Awesome Cynthia – just loved your feedback! We have 25+ containers (prior owner left all their clay pots – can you imagine) so as I was painting the scene, I couldn’t help but feel like I was working one that was a bit roughed up and what have you from the garden. Thanks so much for your description of the pot, I’m thrilled you noticed – the Senneliers OPs are so creamy that a painters knife was used to smear the paint on the container to give it a weathered look. Thank you for guide our eye to the background; beautiful color mix. I love this painting is also because it’s a setting that we actually have in our house by a window or reminded us that we had it before, only more beautiful! 🙂 Thank you, Mary! Your flower paintings challenge the challenge! You are so talented. Beauty is in your eyes and brush! Thank you Resa – really appreciate your feedback and compliment. This was a very fun piece to paint, glad you enjoyed it! Very sweet Paris, thank you so much! Have to agree with Jill…I don’t know whether you’re painting better, you’re picking better subjects, you’re getting better at the background/subject ratio or what, but it’s working and each one is a more tender treat than the one before. This one is lovely, Mary. I especially like the pinks and purple on the wall and window setting off that brilliantly-hued flower! Thanks A! Beautiful and gracious comment, truly appreciated your feedback on this piece. I really think some of the development had to do with the drawings I did this past winter with charcoal – forced me to become a bit more loose, not as detailed oriented and working the value ranges. It’s translated some into painting with oil pastels – we’ll see what happens once I start landscapes and seascapes again. Thanks for mentioning the colors, I loved working them – the gouache underpainting set the stage for the OPs layers. Beautiful Mary! I love how you have captured the light. Wow Mary! I think your window paintings are your best work! They have an old masters feel to them. Absolutely lovely! You excelled greatly in this challenge! Everything worked in this one! I wish I could see it in real life. Thank you so much Hien – really appreciate it. The painting reads better in person as I’m not a pro w/my camera, no matter how much I may try, my photographs don’t measure up. This piece was a lot of fun and interesting to build up the oil pastel layers, while letting the underpainting come through ~ glad you enjoyed the painting. Each painting is more beautiful than the last, Mary. I love how it’s sitting in the window sill. Hi Jill, thank you for your generous thoughts. I really enjoyed painting this scene, it reminded me of an old farmhouse in the summertime with warm light streaming through. Geraniums are one of my favorites. This is lovely! Thank you so much, they are a beautiful flower. The steady ones against all kinds of weather.